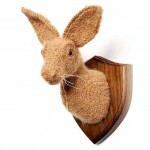 I love the whacky irony of these “trophies” I read about on DesignBoom.com: UK-based artist Shauna Richardson develops life-size animals through the process of crocheting. 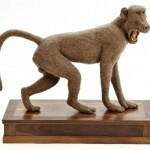 She uses the term “crochetdermy” to better explain her work, which makes strong references to taxidermy. Her pieces are made with materials like coarse wools such as mohair mixes, glass eyes, reproduction claws, etc. The free-style crochet technique she applies is executed with a 3mm hook, using one color and one stitch, with the direction of the stitches highlighting anatomical features. It usually takes Shauna several months to complete one piece.